0R59 2125 Loughborough Brush - Leicester L.I.P. 37099 3Q41 2155 Hither Green P.A.D. - Orpington - New Cross - Rochester - London Charing Cross - Sevenoaks - London Charing Cross - Hayes (Kent) - New Cross - Hither Green P.A.D. 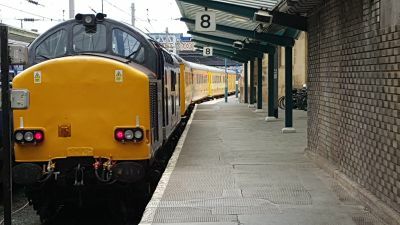 37521 3Q14 2103 Slateford Depot - Heaton T&R.S.M.D. 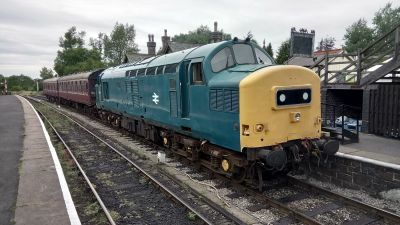 37611 5V84 0559 Castle Donington Emdc - Laira T.& R.S.M.D. 37800 1729 Wembley H.S. - Ilford E.M.U.D. 37099 3Q20 2159 Hither Green P.A.D. - Orpington - London Victoria - Brighton - London Victoria - Orpington - Hither Green P.A.D. 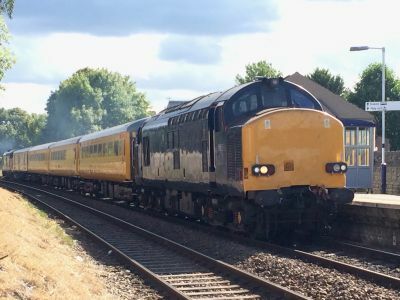 37409 5Z02 0921 Crewe Gresty Bridge (Drs) - Norwich Stn C.S.D. 37884 0M59 1100 Wolverton Centre Sidings - Leicester L.I.P. 37099 3Q41 2157 Hither Green P.A.D. - Uckfield - South Croydon - Surbiton - Hither Green P.A.D. 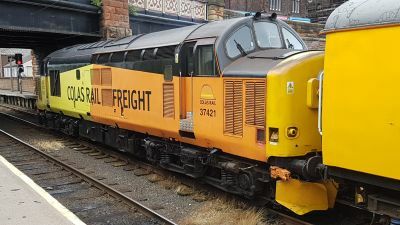 37425 5Z37 0619 Carlisle Kingmoor Tmd(Drs) - Barrow C.S. 37800 0Z37 2215 Wembley H.S. - Ripple Lane West S.S.
37884 0R59 1336 Wolverton Centre Sidings - Leicester L.I.P. 37407 0V91 1945 Norwich T.C. - Ilford E.M.U.D. 0H72 1643 Old Oak Depot - Wembley H.S. 37025 tnt 37254 3Q49 2209 Ferme Park Recp. - London Kings Cross - Ferme Park Recp. - Upper Holloway Up Gds Loop - Grays - Upminster - Grays - Watford Junction Dc - Stratford - Ferme Park Recp. 37219 2330 Willesden Distillers Sdgs - Crewe P.A.D. 37884 5Q51 1019 Northampton Tc Up Sidings - Ilford E.M.U.D. 0H72 1355 Ilford E.M.U.D. - Wembley H.S. 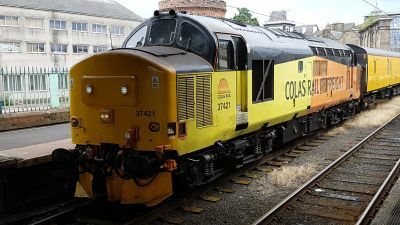 0Z72 1846 Acton Yard Gbrf - Wembley H.S. 37025 tnt 37254 3Q47 0012 Ferme Park Recp. - Cambridge T.&R.S.M.D. - South Acton - Ferme Park Recp. 37099 3Q45 2316 Hither Green P.A.D. - Sittingbourne - Ramsgate - Ashford International - Hither Green P.A.D. 37601 0Z20 1027 Leicester L.I.P. 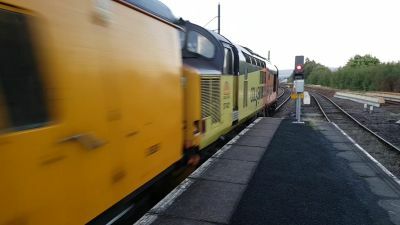 - Bescot Up And Down Goods - Stafford - Park Lane Jn West Mids - Stafford - Leicester L.I.P. 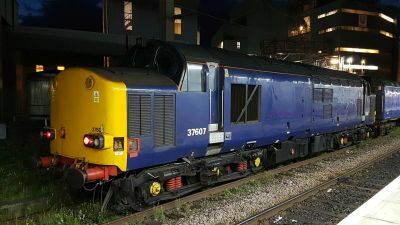 37800 0H72 0520 Leicester L.I.P. - Wembley H.S. 0H72 2155 Old Oak Depot - Wembley H.S. 37099 3Q43 2210 Hither Green P.A.D. - Ramsgate - Hither Green P.A.D. 57002 + 37611 DIT 1600 Ridgmont - Leicester L.I.P. 3Q46 1934 Derby R.T.C. (Network Rail) - London Marylebone - West Ruislip - Ferme Park Recp. 37099 3Q10 2048 Burton Ot Wetmore Sidings - Hither Green P.A.D. 37175 3Q15 1841 Burton Ot Wetmore Sidings - Heaton T&R.S.M.D. 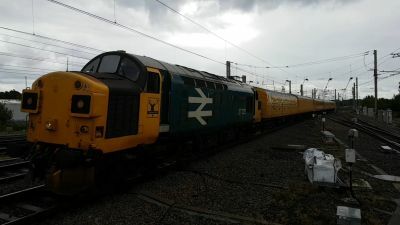 37611 + 66999 DIT 0Z43 1300 Hedon Road Sidings - Longport F.D. 37611 0Z59 1715 Longport F.D. - Leicester L.I.P. 37800 0L59 0945 Wembley Eur Frt Ops Cntre - Leicester L.I.P. 5C40 2045 Barrow-in-Furness - Barrow C.S. 37099 tnt 37116 1Q99 1627 Cambridge Recp 1-3 - Kings Lynn - Ipswich - Norwich - Colchester Goods Loop - Felixstowe Creek R.S	- Mistley - March Down R.S. 37175 3Q21 2040 Hither Green P.A.D. - Orpington - London Victoria - London Bridge - Caterham - London Bridge - East Grinstead - London Bridge - Woking Up Yard Recp. 37025 3Q53 1858 Bristol High Level Siding - Portbury Dock Stop Board - Bristol Temple Meads - Goodrington C.H.S	- Exeter Riverside N.Y.
37059 + 37259 6C22 0727 Carlisle Kingmoor Sdg(Drs) - Sellafield B.N.F. 68002 + 37259 6C18 0303 Crewe Bas Hall S.S.M. - Carlisle N.Y.
37601 0M59 1729 Crewe C.S. - Leicester L.I.P. 37800 0L50 1732 Wembley H.S. - Ilford E.M.U.D. 37025 3Q52 1848 Burton Ot Wetmore Sidings - Water Orton - Coventry - Aston - Coventry - Stratford-upon-avon - Hatton - Tyseley L.M.D. 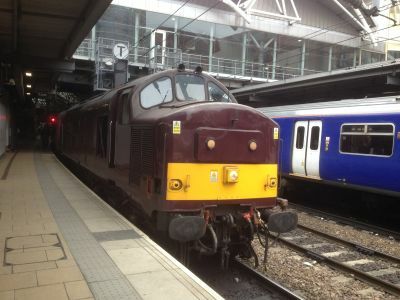 37099 tnt 37116 1Q90 1810 March Down R.S. - London Liverpool Street - Hertford East - London Liverpool Street - Chingford - London Liverpool Street - Enfield Town - London Liverpool Street - Barking Upney Junction - Upper Holloway Up Gds Loop - Ferme Park Recp. 37175 3Q09 2046 Eastleigh Arlington (Zg) - London Waterloo - Epsom - London Waterloo - Clapham Junction - London Waterloo - Clapham Junction - London Waterloo - Woking - London Waterloo - Orpington - Hither Green P.A.D. 37607 3Q01 0327 Burton Ot Wetmore Sidings - Spalding - Lincoln - Cleethorpes - Immingham T.M.D. 37800 0Z73 0430 Ripple Lane West Yard - Acton T.C. 37884 0Z37 1630 Wolverton Centre Sidings - Leicester L.I.P. 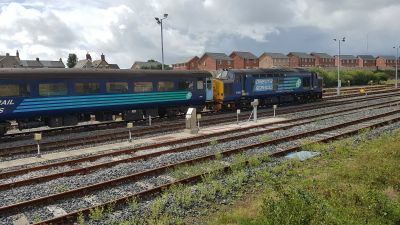 37099 tnt 37116 1Q97 0855 Derby R.T.C. (Network Rail) - West Hampstead Thameslink - Kentish Town - Croft - Loughborough - March Down R.S. 37800 1935 Wembley H.S. - Ripple Lane West S.S.
0M59 1710 Doncaster Up Decoy - Leicester L.I.P. 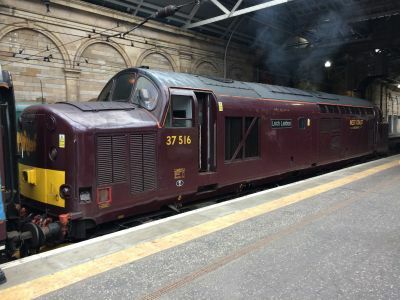 37669 5Z37 1300 Craigentinny T.&R.S.M.D - Fort William J.Yd T.C. 0H72 0927 Old Oak Depot - Wembley H.S. 37219 + 60021 0V61 1910 Crewe Bas Hall S.S.M. - Toton T.M.D. 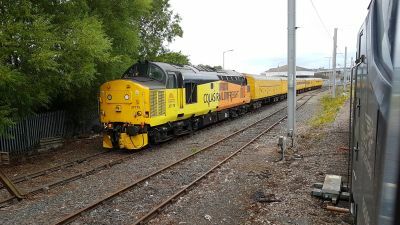 37884 0M59 0701 Mossend Loco Holding Sdgs - Leicester L.I.P. 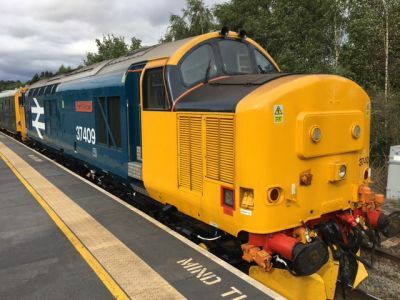 37601 0R59 1511 Castle Donington Emdc - Leicester L.I.P. 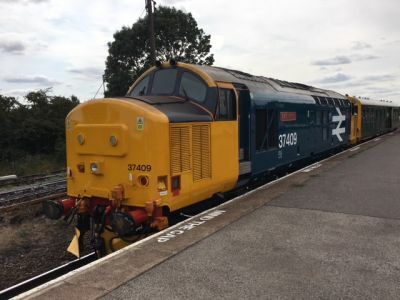 37607 3Z95 1310 Crewe C.S. 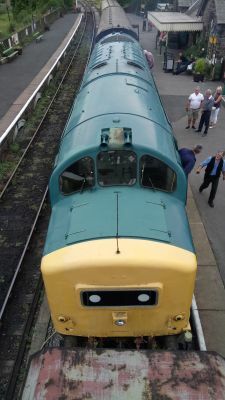 (L&NWR Site) - Shrewsbury. 3Q95 1513 Shrewsbury - Chester - Bangor C.S. 0Z38 1418 Plumstead Yard - Old Oak Depot, terminated at Wembley H.S. 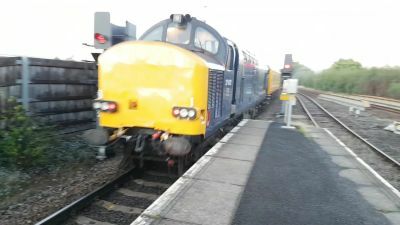 5C59 1635 Workington to Workington H.S. 3Q01 2005 East Midlands Parkway - Southminster - Ferme Park Recp. 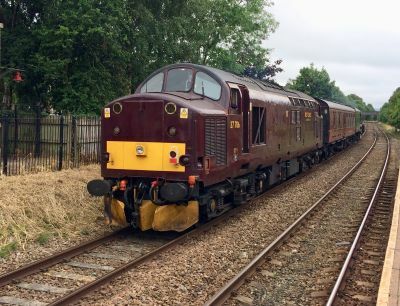 5Q42 1126 Old Dalby - Crewe C.S. 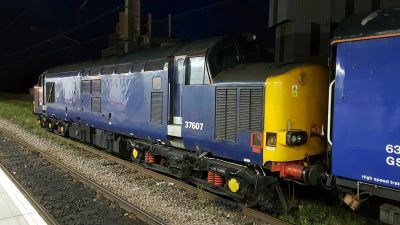 0M59 1700 Crewe C.S. - Leicester L.I.P. 37601 0H72 2100 Old Oak Depot - Wembley H.S. 0M59 1627 Northampton Emd - Leicester L.I.P. 68001 & 37069 + 37218 6C18 0303 Crewe Bas Hall S.S.M. - Carlisle N.Y.
37069 + 37218 0K27 1443 Carlisle N.Y. - Crewe Bas Hall S.S.M. 0M29 1042 Acton Main Line - Leicester L.I.P. 37025 3Q35 2152 Landore T.M.D. - Fishguard Harbour - Whitland - Pembroke Dock - Carmarthen - Port Talbot East - Landore T.M.D. 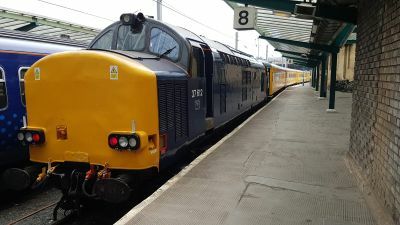 37218 + 37069 0C18 0303 Crewe Bas Hall S.S.M. - Carlisle N.Y.
0K27 1443 Carlisle N.Y. - Crewe Bas Hall S.S.M. 37521 3Q71 2058 Colchester Reception Line - Cambridge - Lowestoft - Norwich T.C. 37607 3Q23 2131 Hither Green P.A.D. - London Victoria - Littlehampton - Bognor Regis - Littlehampton - Hither Green P.A.D. 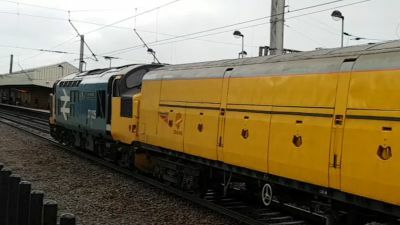 37800 0V84 1000 Doncaster Works Wabtec - Laira T.& R.S.M.D. 37025 3Q34 2152 Landore T.M.D. - Milford Haven - Landore T.M.D. 37607 3Q08 2200 Hither Green P.A.D. - Tonbridge - Redhill - Polegate - Brighton - Seaford - Wivelsfield - Polegate - Redhill - Tonbridge - Hither Green P.A.D.